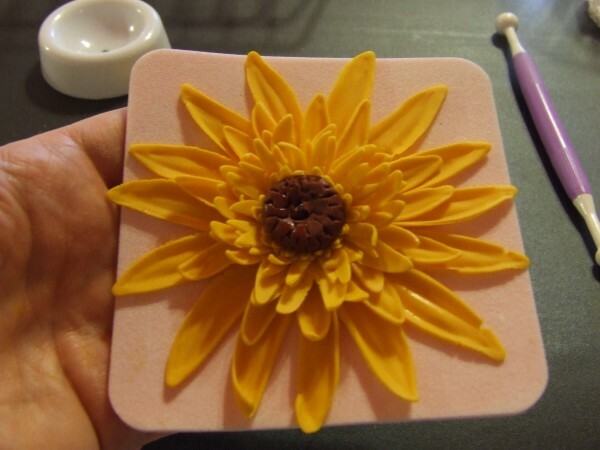 This Gerbera Daisy Tutorial will teach you how to make lifelike sugar Gerber Daisies quick and easy! This is a picture of the supply list. Form center for flower by rolling it into a ball then lightly smash it down the center with your finger to from a disk shape. It should be about ¾ of an inch in diameter. 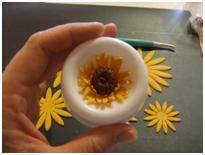 With you small scissor snip into the ball to make it look like the center of a daisy. 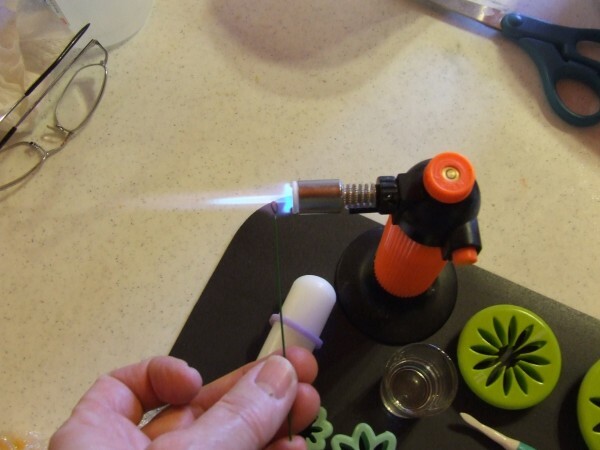 When I make a heavy flower that needs to hang upside down, I use a lighter or a torch to get my wire hot, so that the gum paste will melt around it. Carefully, and slowly, push the hot wire through the center of the disk, being very careful not to push it through too far and burn your fingers. Do this at your own risk!!! Hot sugar keeps burning for a long time if you get it on you. Set aside to let cool and set. 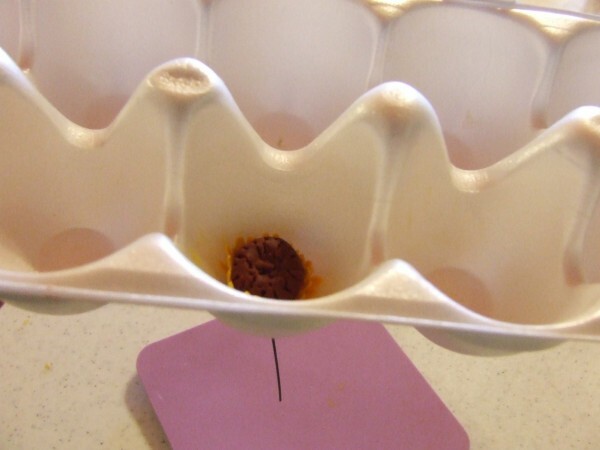 Poke wire in center of the cup of an egg carton to dry for approximately 10 to 15 minutes. I formed all my centers at once, and then used the ones I did first that were dryer. 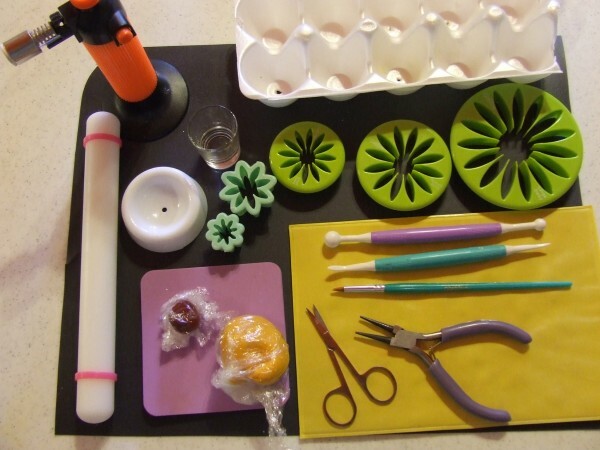 Follow the same procedure for snipping and thinning the next size (#4), but instead of putting them in the egg carton put them in the flower former. Set aside to dry and set. 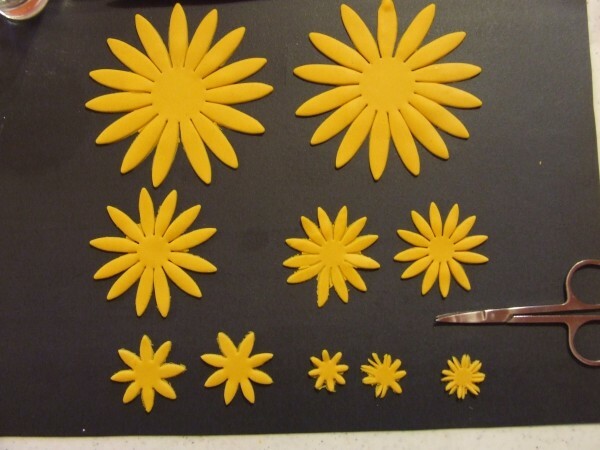 Soften and thin the rest of the cut out flowers, don’t snip any of the larger petals. 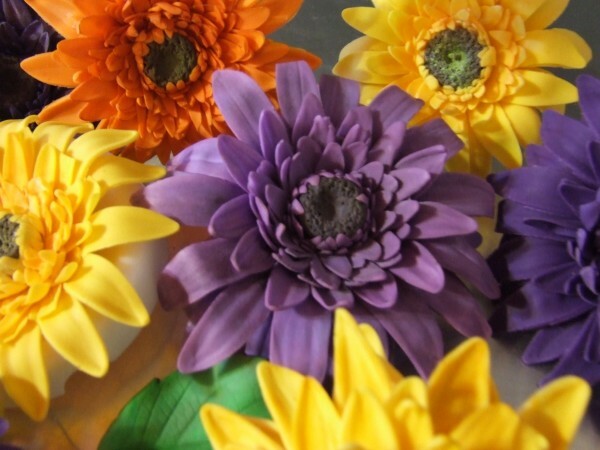 Using the veining tool go around the outside edges of each petal, this is the secret to making them look realistic, because it pops up the edges and centers of each petal. 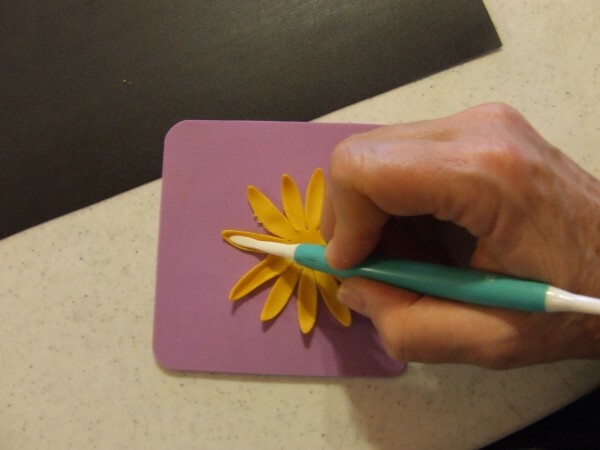 Place the flower cutout on the center of thin pink foam pad, which has a hole in the center for the wire. 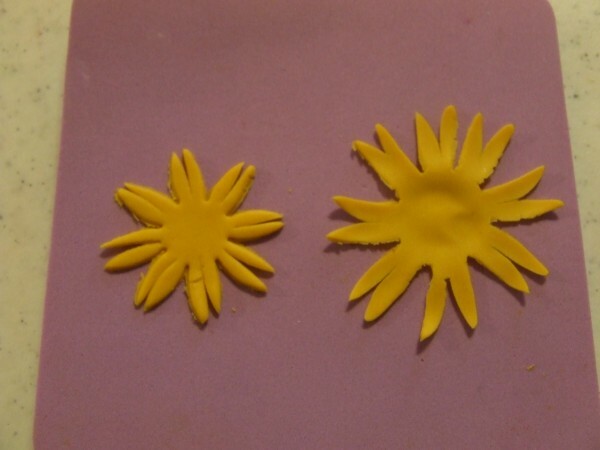 Use a small amount of gum glue on the petals and then slide it up and attach it to the flower, alternating the petals. 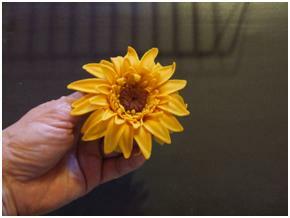 Follow the same procedure until all the petals are attached to your flower. Dry it on the small white flower former over night. 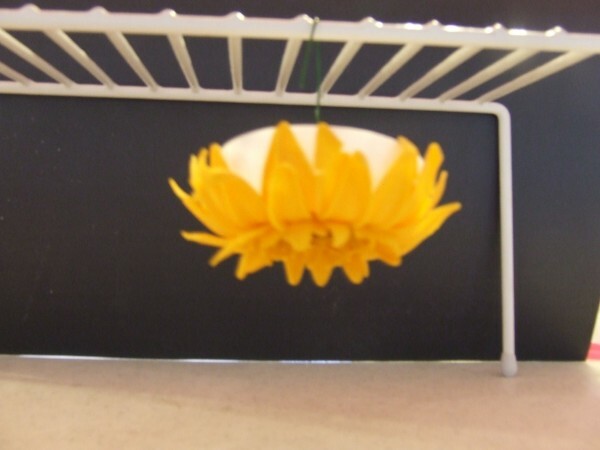 The petals will look wilted and flat, but after the flower has dried for about 24 hours you will hang it upside down and gravity will make it look more alive. This one looks kind of rough, as it took me longer to make (because I was taking one handed pictures) so the petals dried out and cracked. I used some petal dust on my first ones to highlight and darken the shadows. If this tutorial is not clear or if you have questions please feel free to PM me. Looks beautiful! Great work! Thanks for sharing! Thank you so much for sharing this tutorial. Yours were the best I had ever seen and I've been dying to try them. Hooray! Great job on your tutorial! Thanks so much for taking the time to teach us. I can't wait to try them out! LOL! It took me long enough. Thanks for your nice comments. Awesome! Thank you so much! I am pretty sure these are the best I have ever seen! Thank you this is awesome!! quick question: where did you get your small torch?? never knew they make them so small. Thank you again!! Beautiful flowers, and thank you for posting the tutorial. Thank you all! @ Rosie2, I got my small torch at Harbor Freight. It is a discount hardware store here in the West. I think it was only $6.00, but even though it says it is refillable, I could never get it to work. I ended up throwing it out. 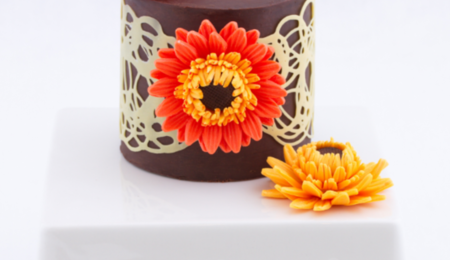 im so glad to see this done.i have a wedding cake coming up to do and it has gerbera dasies.will be trying this. I love your work with these flowers...thank you for sharing with us so that we might be able to do this also! Thank you for your tutorial. Can't wait to try making some. thanks for sharing ,mine came out realy nice ! love it, thank`s for posting this tutorial. please, what is the size of the cutters (diameter)? These are just perfect! perfect flowers! i thought they were real ones! thanks for sharing! Thank you! This is a great tutorial. Awesome tutorial and just an FYI, you can get the torch at a local smoke shop as they are used to light cigars and refillable. A decent one costs about 15.00 but it will last you forever! Any way you can make a video tutorial? I learn best by watching and these are gorgeous!